The country’s first pair of wind turbines, which will electrify 300 households, were inaugurated, today. Each wind turbine produces 300 kilowatt of energy, enough to power 150 households throughout. The Prime Minister, Tshering Tobgay inaugurated the first pilot wind power project of the country in Rubesa village under Wangdue Phodrang. “The project is an effort to enhance the energy security in the country by diversifying the energy supply by promoting alternative renewable energy technologies,” said the Officiating Director of Department of Renewable Energy, Mewang Gyeltshen. It took 18 months for the Department of Renewable Energy, under the economic affairs ministry, to install the turbines. “It has become a matter of urgency for the country to make appropriate investments in other alternative renewable energy due to the rising energy demand, growing import of fossil fuels, and risk of reliance on single electricity source and impending threats of climate change,” said Mewang Gyeltshen. 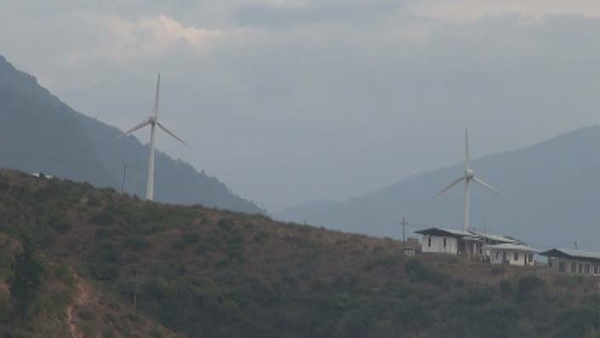 He said they are now in the process of identifying actual potential of alternative renewable energy Bhutan has. The pilot project has been developed to demonstrate the technical feasibility of generating wind power that will alleviate the power shortage during lean season and to gain practical experience in planning, constructing and operating the wind firm in the country. It was developed at the cost of Nu 177 M funded by the Asian Development Bank the government. Economic affairs minister, Norbu Wangchuk and health minister, Tandin Wangchuk also attended the inauguration.